The last decade has perhaps been the worst ever for both earthquake scientists and earthquake victims. Some 630,000 lives have been lost since 2000 due to earthquakes and associated tsunami. Although technological advances have continued to improve our ability to monitor earthquakes, document their effects, and engineer earthquake resilient structures, some of our scientific short-comings have become strikingly, and very publically, apparent. The 2011 Mw 9.0 Tohuku earthquake greatly exceeded previous scientific estimates of Mw potential1 (Mwmax ~7.7 to 8.5) and killed 20,000 in its tsunamogenic aftermath, prompting a rethink of whether the relatively short timeframe captured by historical and instrumental data really enables us to understand the earthquake potential of specific segments of subduction zones. The prosecution of earthquake scientists for issuing ‘inexact, incomplete and contradictory’ information prior to the 2009 Mw 6.3 L’Aquila earthquake (309 fatalities) that ‘ultimately contributed to a higher death toll when the earthquake eventuated’ illustrated the challenges in seismic risk communication. And several of the most fatal continental earthquakes of the last decade (e.g., 2010 Mw 7.0 Haiti) have occurred partially, or entirely, on faults previously unknown to scientists, highlighting that there are many hazardous seismic sources and potential rupture scenarios that have not been recognized. This essay focuses on the last issue, and asks two questions (1) How can we better constrain the behaviour and Mw potential of complicated fault systems using the oft incomplete geologic records of faulting?, and (2) How can earthquake ‘clustering’ be recognized in the geologic record? I use the 2010-2011 Canterbury earthquake sequence (CES) to address these questions because it is an excellent example of a temporally clustered earthquake sequence involving a complex array of primarily blind faults. As a Christchurch-based earthquake scientist, it is an earthquake sequence with which I am intimately familiar. The following earthquakes of the last decade have occurred partially, or entirely, on previously undocumented and structurally complex fault networks: the 2003 Mw 6.7 Bam (26,000 fatalities), 2005 Mw 7.6 Kashmir (86,000 fatalities), 2008 Mw 7.9 Wenchuan (more than 87,000 fatalities), and 2010 Mw 7.0 Haiti (316,000 deaths) earthquakes. In terms of earthquake clustering, a classic example is the 1992 Landers earthquake sequence (Mw 6.1, 7.3, and 6.2 earthquakes) and following 1999 Mw 7.1 Hector Mine earthquake that involved the close temporal succession of complex ruptures of many faults with major earthquake recurrence intervals on the order of > 104 yrs2. There are many other examples of temporally clustered earthquake sequences around the globe involving complex fault networks. Figure 1: Epicenter locations for CES ML≥3.0 events from 4 September 2010 to 10 February 2013 (data from http://www.geonet.org.nz). Projected surface locations of major faults in yellow5,6 and location of mapped surface ruptures in red6, showing the complex array of primarily blind faults that ruptured during the CES. GF – Greendale Fault. PHF – Port Hills Fault. We use the GeoNet Regional Centroid Moment Tensor solution for the Darfield earthquake (Darfield CMT) (http://www.geonet.org.nz/resources/earthquake/). The 2010-2011 CES in New Zealand’s South Island involved the rupture of at least 12 previously unknown faults in a series of Mw 7.1, 6.2, 6.0 and 5.9 earthquakes over 16 months (Figure 1). The Canterbury Plains immediately to the east of Christchurch, where the fault system hosting the Mw 7.1 earthquake lay undetected, had been subjected to scientific study for several decades, including seismic reflection surveys of active faults. The 2011 Mw 6.2 Christchurch earthquake that occurred during this sequence caused 185 fatalities when a blind fault ruptured beneath the city and generated peak ground accelerations in excess of 0.4-0.6 g horizontally and 1 g vertically in central and eastern Christchurch (Figure 1). Such an earthquake sequence could occur at any location on the planet, and if it was to occur beneath a highly populated city lacking the quality infrastructure and building codes of New Zealand, the number of expected fatalities could be in the hundreds of thousands or even exceed one million. Although the specific location of the CES faults was unknown, they were considered as floating sources of Mw max 7.2 in the probabilistic seismic hazard model of Christchurch3. It is essential to understand how these types of scenarios are manifested in the geologic record, and thus how they should contribute to seismic hazard assessments. Seismic hazard models combine paleoseismic studies of faults and other earthquake-induced features with historical earthquake records, seismology, GPS, and remote sensing techniques to derive information about the timing, frequency and magnitude of earthquakes. This information is combined with knowledge of seismic wave attenuation and/or amplification and site specific studies (Figure 2) to construct probabilistic seismic hazard curves for implementation into building codes. Because in many locations the historical record is short relative to the earthquake recurrence interval for a given fault, the behaviour of that fault in time and space must be deduced from the geologic and geomorphic record. The relevance of past earthquakes on a given fault for future fault behaviour requires a model based on the timing and slip of previous events. Some evidence suggests that large, well-developed, fast-slipping plate boundary faults are best described by ‘slip-characteristic’ and ‘time-characteristic’ earthquake models, while earthquakes on more structurally complex faults in continental interiors may exhibit larger variations in slip and recurrence intervals suggestive of ‘clustering’ behaviour. Continued paleoseismic investigations of both plate boundary and plate interior faults will continue to improve our understanding of fault rupture behaviour. Figure 2: Schematic diagram of how characteristics of the fault influence coseismic rupture behaviour and resultant characteristics of seismic waves generated by the source. Characteristics of source seismic energy are modified on their way from source-to-site, complicating interpretations of the seismic source from inferred strong ground motion characteristics using the geologic record. The 2010-2011 CES occurred within a relatively low strain rate area some 150 km east of the largest and most active plate boundary fault (Alpine Fault) in the South Island of New Zealand. Geodetic data indicate ~2 mm yr-1 of contraction oriented at 277° ± 8° across a 125-km-wide crustal block encompassing the CES4. The CES initiated with the 4 September 2010 Mw7.1 Darfield earthquake, which began on a steep reverse fault and involved the rupture of 7-8 fault segments including E-W striking right-lateral faults, NE-striking reverse faults, NNW-striking left -lateral faults, and NW-striking normal right-lateral faults5,6. The largest moment release, as indicated from the GeoNet Regional CMT focal mechanism solution (http://www.geonet.org.nz/resources/earthquake/), and teleseismic analyses (USGS, http://earthquake.usgs.gov; Global CMT, http://www.globalcmt.org/) is consistent with the right-lateral rupture of the Greendale Fault (equivalent to a Mw 6.9-7.0 earthquake) however the involvement of several blind sources contributed to the larger Mw of the earthquake (Figure 1). 1. Surface rupture in major (≥Mw 7.0) earthquakes as manifested by discrete fractures may record as little as one third of the total surface displacement and one half of the subsurface rupture length (Figure 3a). This will vary widely depending on the properties and spatial distribution of the faulted material and the slip on the fault. However, because of the way earthquake ruptures have traditionally been mapped, the amount of maximum and average slip on discrete structures can be used with existing empirical relationships to reliably estimate the Mw of the earthquake source. The Greendale Fault that ruptured in the Darfield earthquake produced a 29.5 ± 0.5 km long surface rupture7 across a low relief Late Pleistocene alluvial plain. Fencelines, roads, crop rows, and other linear features allowed us to document coseismic displacements across the fault zone with high precision, even where evidence of discrete surface fracturing was not present. Maximum dextral displacements exceeded 5.2 meters and maximum vertical displacements exceeded 1.5 metres, and average net displacements along the fault length were 2.5 m7. GF surface deformation was typically characterized by a ~50-150 m wide zone of distributed folding with an internal zone of discrete surface fracturing that ranges in width from 5 to 50 m (Figure 3a). Only ~20 km of the surface rupture length (SRL) was associated with discrete surface fracture, and discrete surface fractures only accommodated about one third of the total displacement. The subsurface length of the GF exceeds 40 km. Without anthropogenic markers much of the deformation on the GF would have gone unrecognized. If we use the measured SRL with scaling relationships8 to estimate the Mw of the earthquake, as would typically be conducted for a paleoseismic analysis of a prehistoric fault rupture, we derive Mw ~6.8 for the total SRL and Mw ~6.6 for the portion of the fault with discrete surface fracturing. Conversely, using empirical scaling relationships with our measured displacements, we derive an estimate of ~Mw 7.4. However, if we consider the only the displacements associated with discrete fracturing, we derive estimates of Mw 7.0, which is consistent with seismologic and geodetic data for this seismic source. So faults deform much more of the surface then we might recognize from the geologic record, particularly in sediment, but we can deduce meaningful information about the likely earthquake magnitude from preserved displacements on discrete fractures, even for faults with long earthquake recurrence intervals. For this reason, it is important to provide measurements of both surface fracturing displacement and broader surface deformation for earthquakes in the modern era, so that the former can be used to maintain consistency with existing scaling relationships. This will maintain clarity in these relationships, and inform how to interpret prehistoric ruptures, where localized deformation on discrete fractures is typically the only displacement that can be confidentially measured. Figure 3: A) Aerial photograph of the Greendale Fault rupture trace. Lateral displacement across discrete fractures accounts for only a modest component of both the displacement recognizable from observed surface folding, and the total longer-wavelength folding recorded by deformation of agricultural features. B) An oxidized ‘paleo’ liquefaction feeder dike (oxidation reflects longer residence in fluctuating water tables) between two CES feeder dikes able to be traced to the surface as the source of CES sand blows in areas of lateral spreading C) A boulder released by rockfall in the CES leaning against a boulder released from a prehistoric rockfall event. 2. Major changes in surface displacement are common along surface ruptures. When we consider the location of these changes on the Greendale Fault, we note that they tend to correspond with fault step-overs and/or intersection zones with other blind faults9 (Figure 1). The latter are not otherwise identifiable in the near surface geological record as their rupture tops end some 500m to 1 km beneath the surface5. We suggest that targeting these locations for subsurface investigations (e.g., seismic reflection, other geophysical surveys) along paleo- surface ruptures may enable the detection of subsurface faults that may rupture coevally with the identified fault and thus increase the moment potential of a given source. In the case of the Darfield earthquake, these hidden sources increased the total seismic energy by 1.4 to 2 times, which is significant. 3. Our trenches into the GF have uncovered preliminary evidence for a ‘penultimate’ earthquake on the GF with the same amount of slip as was recorded at the surface. At this stage we think this occurred between 20 and 30 kyr ago. It is interesting to consider how a fault rupture, initiating as a rupture patch some 10 km below the surface in greywacke bedrock, finds its way through metamorphic and layered sedimentary rocks and some 500-1000 m of gravel to rupture along the same fracture with the same displacement as an earthquake some 20-30 kyrs before it (Figure 3). This raises interesting questions. Does this repeated slip-at-a-point indicate a similar magnitude of the penultimate Late Pleistocene quake? This can never been known absolutely, but the best way to answer this is to get as many measurements of the penultimate rupture as possible and compare these to the Darfield earthquake displacements. But does similar slip of the Greendale Fault implicate the involvement of the other faults that contributed to the total moment release? An approach to this is to model the interactions of the different fault segments10. Would all of the faults in the complex array that ruptured in the Darfield earthquake still have ruptured if the earthquake initiated on a different fault, rather than the reverse fault to the north of the Greendale Fault? Our preliminary Coulomb stress modelling suggests yes. So it may be that the occurrence of so many structurally complex, multiple fault ruptures recently reflects improved earthquake instrumental recording and monitoring, and that most continental earthquakes are complex. This is relevant for understanding how combining point measurements from a prehistoric surface rupture with geophysical investigations and modelling can better inform us about possible rupture scenarios and Mw potentials from complex fault systems. 1. Geological investigations at all sites where major liquefaction, rockfall, and lateral spreading occurred during the Canterbury earthquake sequence have uncovered evidence for ‘paleo’ features attributable to past earthquakes from different seismic sources. This includes paleo feeder dikes and sand blows in areas of liquefaction and lateral spreading (Figure 3b), and prehistoric boulders caused by rockfall on hillslopes where rockfall occurred during the CES (Figure 3c). In many cases, new subdivisions were developed in these areas in the last decade, adjacent to or on top of this geological evidence. Based on what we know of the return times of major earthquake on the faults that ruptured in the CES, these features almost certainly have not been generated by earthquakes on the same faults because preliminary dating makes them much too young. Assigning earthquake return times for specific faults from these ‘off-fault’ records of earthquake shaking would be erroneous in this case. 2. The occurrence of prior earthquake shaking-induced processes (e.g., cliff collapse, rockfall, lateral spreading, liquefaction) does not reduce the susceptibility of a site to future processes, and will in many cases make a site more susceptible to future processes. Some sites in Christchurch liquefied as many as ten times during the CES11, as manifested at the surface by the formation of sand blows (Figure 4). Examination of the feeder dikes indicates repeated reactivation, implying that the formation of efficient ‘conduits’ in preceding events provided lower resistance pathways for future liquefaction, and that any ‘densification’ of the liquefiable source was not sufficient to inhibit further liquefaction in subsequent earthquakes. Repeated cliff collapse was observed in major aftershocks. The ‘cleansing’ of unstable rock faces by earthquake shaking in fact generated more fractures that produced equally unstable rock faces susceptible to future collapse. 3. The preservation of shaking-induced phenomena in the geological record will be variable and challenging to interpret. In the case of the CES, liquefaction-inducing earthquakes were sourced from faults west, south and east of the city. They were located up to 50 km apart, ranged from Mw 5.2 to 7.1, and generated PGAs between 0.1 and 0.47g11. Attributing a liquefaction event to a specific fault rupture using the geologic record from this site would not be possible as similar PGAs and hence volumes of liquefaction ejecta were generated by different sources, and the short time interval between liquefaction inducing earthquakes would not be distinguished by dating techniques. Trenching of surface sand blows reveals that witnessed liquefaction events are recorded in the stratigraphy of the sand blows, which consist of a succession of fine-sand ejecta packets capped by silt drapes. However, surface silt drapes crusted up and eroded and sand blows evolved into forms indistinguishable from deposits of alluvial and aeolian origin within months of the causative earthquake (Figure 4). Shorter time intervals between inducing earthquakes, as would be expected from temporally clustered (e.g., months to yrs) earthquake sequences involving multiple fault ruptures, will result in much better preservation of sand blow stratigraphy including the preservation of silt drapes than recurring earthquake from the same source (return times of ~102-105 yr). The number feeder dike generations identifiable in subsurface investigations should be treated as an absolute minimum estimate of, and may significantly under-represent, the number of liquefaction-inducing earthquakes11. 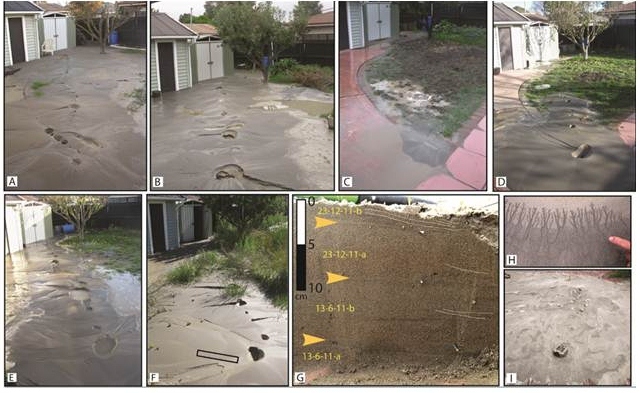 Research in the backyard of my former property revealed only two clearly distinguishable feeder dike generations despite ten episodes of sand blow formation (Figure 4). On flat summit surfaces, boulders were displaced from soil sockets in the Darfield earthquake and not displaced in the Christchurch earthquakes, despite significantly higher PGAs in the latter. This illustrates that the duration and frequency content of seismic shaking creates additional variables that influence the extent to which certain geomorphic phenomena occur. This requires that constraints on source Mw, and source-to-site seismic wave attenuation and amplification characteristics is required to link specific records of shaking to specific faults. Catastrophic cliff collapse occurred under PGAs of ≥0.4-0.5g in two aftershocks of the Darfield earthquake, but not in the mainshock. Only 16 weeks lapsed between these triggering earthquakes. Smaller isolated rockfall events occurred from the same cliff face in some smaller aftershocks with PGA ≥0.2g. Distinguishing these events in the geological record will be immensely challenging. The short intervening period between triggering earthquakes precludes intervening sediment deposition that could indicate different events in the geologic record if preserved. It would thus be challenging to attribute rockfall volumes to associated PGAs due to the inability to distinguish these different events in the rockfall ‘stratigraphy’. This would make attribution to a specific seismic source challenging. For instance, doubling the duration of strong ground shaking above threshold PGAs in a single event could have generated the same response as the two seperate events here. Different sources could create a different distribution of shaking phenomena and hence different rockfall response (Figure 2). The near-surface geologic record of earthquakes includes fault rupture where fault slip at seismogenic depths is sufficient to reach the surface and a variety of shaking induced phenomena that may be preserved in the geological record. Measurements of fault slip on discrete surface fractures may significantly underestimate the total amount of coseismic surface displacement revealed by broader surface folding. Slip gradients along surface ruptures that are not associated with fault step-overs may provide clues into the location of subsidiary ‘blind’ faults that may rupture coevally with the identified fault and thus increase the total seismic moment release. Seismological and geophysical investigations of these faults can be combined with paleoseismic investigations and rupture modelling to assess the likely rupture behaviour and Mw potential of complex fault systems. Studies of the timing of past earthquakes on multiple faults may be used in some circumstances to investigate whether these records are best explained by temporal clustering. This approach may be most fruitful in settings where fault recurrence intervals are long compared to the age resolution of the dated material used to constrain the timing of the last event. Earthquake shaking processes including liquefaction, boulder displacement, rockfall, and lateral spreading will relate both to earthquake source attributes and the site specific attributes of earthquake shaking including PGA, shaking duration, and frequency content. Understanding how each of these processes is manifest in the geologic record requires a thorough understanding of the seismic thresholds required to induce these processes, the internal dynamics of each process, and how the features produced from these processes are preserved and/or altered in time and space. Both under- and over-estimates of the number of causative earthquakes are possible from misinterpretation of the records of earthquake shaking, and this will generally be inversely proportional to the frequency of inferred events. Attributing off-fault shaking records to a specific fault source requires an understanding of how source characteristics influence seismic wave characteristics and how seismic waves may attenuate or amplify on their path from source to site. However, some features, such as fossil sand blows, will be better preserved for temporally clustered earthquakes11, providing qualitiative evidence of this fault behaviour. Historical earthquakes provide opportunities to document these relationships in high detail that can only serve to improve our understanding of the geological record of prehistoric earthquakes. I am deeply indebted to my wonderful group of postgraduate students, particularly Brendan Duffy, Timothy Stahl, Eric Bilderback, Narges Khajavi, Sarah Bastin, Gregory De Pascale, Sharon Hornblow, and Peri Sasnett for their monumental and inspiring efforts to convert earthquake trauma into scientific legacy. 2 Rockwell, T., Lindvall, S., Herzberg, M., Murbach, D., Dawson, T., and Berger, G., 2000, Paleoseismology of the Johnson Valley, Kickapoo, and Homestead Valley faults: Clustering of earthquakes in the eastern California shear zone: Bulletin of the Seismological Society of America, v. 90, p. 1200–1236, doi:10.1785/0119990023. 3 Stirling, M., M. Gerstenberger, N. Litchfield, G. McVerry, W. Smith, J. Pettinga, and P. Barnes, 2008, Seismic hazard of the Canterbury region, New Zealand: New earthquake source model and methodology, Bull. New Zeal. Natl. Soc. Earthquake Eng. 41, 51–65. 4 Wallace, L. M., R. J. Beavan, R. McCaffrey, K. Berryman, and P. Denys, 2007, Balancing the plate motion budget in the South Island, New Zealand using GPS, geological and seismological data, Geophys. J. Int. 168, 332–352. doi 10.1111/j.1365-246X.2006.03183.x. 5 Beavan, J., Motagh, M., Fielding, E., Donnelly, N., and Collett, D., 2012, Fault slip models of the 2010–2011 Canterbury, New Zealand, earthquakes from geodetic data, and observations of post-seismic ground deformation: New Zealand Journal of Geology and Geophysics, v. 55, p. 207–221, doi:10.1080/00288306.2012.697472. 6 Elliott J. R., E. K. Nissen, P. C. England, J. A. Jackson, S. Lamb, Z. Li, M. Oehlers, and B. Parsons, Slip in the 2010-2011 Canterbury earthquakes, New Zealand, Journal of Geophysics Research, V117, B03401, doi:10.1029/2011JB008868, p1-36, 2012. 7 Quigley, M., Van Dissen, R., Litchfield, N., Villamor, P., Duffy, B., Barrell, D., Furlong, K., Stahl, T., Bilderback, E., Noble, D., 2012, Surface rupture during the 2010 Mw 7.1 Darfield (Canterbury, New Zealand) earthquake: implications for fault rupture dynamics and seismic-hazard analysis, Geology 40 (1) p. 55-59. 8 Wells, D. L., and K. L. Coppersmith, 1994, New empirical relationships among magnitude, rupture width, rupture area, and surface displacement, Bull. Seismol. Soc. Am. 84, 974–1002. 10 Parsons, T., Field, E.H., Page, M.T., Milner, K., 2012. Possible Earthquake Rupture Connections on Mapped California Faults Ranked by Calculated Coulomb Linking Stresses. Bulletin of the Seismological Society of America, 102(6), 2667-2676.